Last week, I had the pleasure of reading the German edition of Anna Hope’s Wake which is published by Rowohlt and called Abgesang. I won an ARC from Buchboutique. Thank you! The English original was first published by Transworld. Two years after World War I, the city of London still hasn’t fully recovered. While we walk the streets, we encounter men physically and mentally wounded by the war, but they try to keep smiling, just like the city tries to shine. In Wake, Anna Hope leads us to a glamorous dance hall, an underground club, a pensions office, the homes of different people and back to the battle fields. All these places have a unique feel to them and mirror the emotions of the characters moving within their walls and boundaries. The three main characters, Ada, Evelyn and Hettie, are women in different stages of their lives. You could say that they stand for all women living through these years of sorrow and hope. I felt most drawn to Evelyn, as she is a well crafted character who allows us a vivid look at not only her past and her present, but also her possible future. Of course Wake offers male characters as well. One of them is charming Ed. He is quite a surprise and I really wish I could have found out more about his person, his thoughts and his dreams. The connections between the three women slowly unfold and some don’t come as a surprise. But in my opinion Wake isn’t about suspense and thrill, it’s about the invisible wounds of war which won’t heal that fast, and it’s about finding happiness in a situation that seems hopeless. While its main focus is on the story of Ada, Evelyn and Hettie, Wake also has a second, parallel storyline that shows the funeral ceremony preparations for the body of the Unknown Soldier. I loved how much emotion was put into this sub plot. It was as if I had been there myself. Wake is a heart-wrenching debut that will transport you back in time and give you the women’s view on the consequences of war. Haha it’s always the same with these wish lists isn’t it? They are always growing. ;D I’d add it. Pingback: Friday Finds – 14/03/14 | Im Lesefieber! 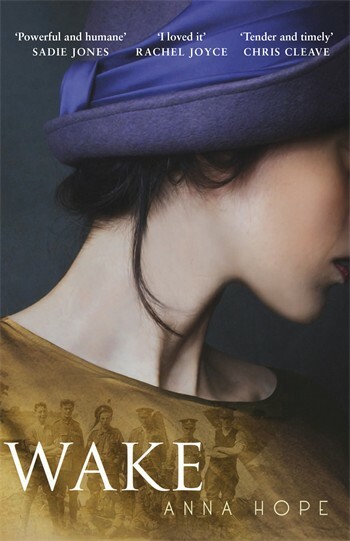 This is one of my favourite books about World War I, Anna Wake manages to depict the lives of three very different women in such a way that as the book progressed I grew to understand them. As you say the sub plot of the funeral of the Unknown Soldier is poignant and underpins the damage done to a whole generation. Great review of a fantastic book. Thank you! Can you recommend any other WWI novels? Do you plan on reading The Moon Field by Judith Allnatt? I’ll definitely buy it sometime this year. I’ve read The Moon Field, another 5 star read in my opinion. The other one that I’d suggest is Worthless Men by Andrew Cowan which depicts life in a nameless English town in 1916 which examines the values of a variety of characters of the time.